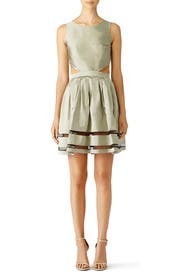 Cut outs add edge to this otherwise feminine allison parris dress. We love it with sparkling gold jewelry. This dress runs true to size. We recommend going one size up for backup (see following fit notes for exceptions). Sized: 0-12. Green crepe de chine (100% Polyester). Sleeveless. Crew neckline. 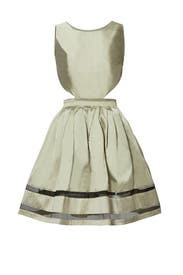 Full skirt with illusion hemline detail. exposed back zipper. Partially lined. 37” from shoulder to hemline. Made in USA. I decided to rent this when the dress I'd originally picked for my birthday celebration didn't fit - this one was in the store. I never would have chosen it online. The cut outs and mesh were great, the color was different in a good way. The top portion was a bit snug so for women with larger chests I'd size up. Would rent again.